Natural comfort - Natural Comfort Japanese Futons at the BeddingShop.com - the 1st and only online BeddingShop in Hong Kong since 2000. 4" - For people who wants a flexible sleeping solution and ultimate straight spine support. Quite comfortable while totally easily foldable. 5.5" - Great comfort still foldable ! 6" - Great comfort for use on bed frame with slack, soft and firm. 8" - For people who demands higher comfort as a healthy permanent mattress use. ~ A Natural Choice for your family. 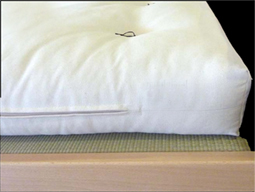 FUTON (Shikibuton) is the Japanese word for bed roll. It is made of natural cotton fill giving a firm and comfortable support for the perfect rest. It can be used on a variety of bed bases, acting like a sofa bed, or even lay straight on the floor as Japanese style of Tatami. 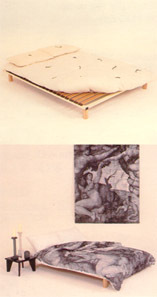 WHY JAPANESE COTTON MATTRESS (FUTON)? Sleeping on a bed of pure cotton makes senses. Cotton gives natural orthopedic support. It keeps your body warm in the winter while it allows the best breathing for your body in the summer time. Unlike foam, cotton will not deform due to aging so it's super healthy for spine for you, your children or your parents for long term terms. Cotton mattress is an Eco Friendly natural product and sound to use for yourself and your children. No bed is as accommodating as Futon - you can sleep, sit, rest on the futon as free as you like. When you are done with it, you simply roll it over and store in your wardrobe. It last as long as a good quality mattress and needs minimal care. Tatami - Tatami poster bed - Tatami Zabuton - Japanese mattress - Shoji Screen - Shoji Lamp - Silk Comforter . 4-fold for cupboard storage avail seperately or tie up with a Cotton Belt avail seperately $80/pc! For those who wants more comfort while foldable. FIRM COMFY 6.4 inches Futon, suitable for bed frame with slack! COMFY 8 inches Futon for the pampering needs! Normal delivery in 72 hrs (all items are stock in HK). Urgent request possible our fastest in 3 hrs to Central (surcharge apply). 3% min apply delivery available to most city areas of Hong Kong, Kowloon and N. T.; Island areas require special arrangement. Please see our delivery schedule or contact us for more information.